So the EVS file format seems to be a list of commands and some of those commands have parameters. which makes it a pain to figure out where a command starts and ends. saving lots of time in figuring out where each command starts and ends. without having to worry about breaking rest of the commands. The game has two commands for printing to the screen. My guess is that it prints a list of choices? And the slash separates the choices the player can choose? 1 - In some lines there's this weird '▽' character. I'm not sure what it is. It might be a "wait for button press" pause mid-message-box instead of at the end of the message box. If you have any theories, I'd love to hear them! I do not want you / Kira attempting to translate the above (yet). I'll probably create a translator friendly format, collapsing duplicates etc. Ignore the number before the func_0001, that is the index (1st, 2nd, 3rd) of the current print command within the EVS file. The parameters to focus on for example are 00000001, 00001000, 00005B11, and "綾波っ！！\n\0"
but I'm wondering what the first three parameters are. Maybe those who've played the game might notice some patterns? e.g., "Shinji's lines all have the 2nd parameter being 00000823" or something. Third parameter seems unique or is 00000000 - this might be the sound file. and it has 00000000 in the third parameter, then we know, etc. You can use the line numbers in the file or maybe the Japanese text as a marker. Reichu wrote: Further support, BTW, for your suspicion that Alfa linked sound files to text. There's text here for all the pilot voice clips used in the battle animations, even though no text accompanies these vocalizations in-game. Here's an example of what I mean (this one is これでも食らえ！！ in bimtext). Miscellaneous observation: superscript 2s aren't being rendered correctly (as in N^2 or S^2), with varied results. (S^2 being turned into a capital Greek sigma, for instance.) I've checked footage of the game and they are supposed to be there, so maybe you have a better idea of what's going on? Looks that way. Three of these I can pinpoint to critical moments in specific character scenarios, when everything stops and you're forced to make a game-changing decision. \n tells the game "line break here", and ▽ tells the game "start new dialogue box". Once it reaches the \0, it moves onto the next. This should be of some use in contextualizing dialogue for translation purposes. (I'll throw together a complete version of the first list for the inevitable notes file.) Pity about 00000000, though -- there's a significant amount of text that's inner monologue with no voice clips and no character name on the text bubbles. Parameter 2 has me completely stumped. Every time I think I've got an inkling, I find an example that completely obliterates my idea. The EVS dump looks golden so far, BTW. Every piece of cut scene dialogue I've searched for has turned up, so hooray! Just the random phrases the characters say to one another, like greetings? Yeah. It seems to be everything under the "walk up to person and chat them up" dialogue tree, which is obviously A LOT OF STUFF. I documented what a lot of the specific "branches" and "twigs" are years back, so that'll help me write a translators' guide to this mess (very slowly). That's all I have for now. Will catch up on the rest later. Great work Reichu, especially correlating the list of names to the one in the executable file! Reichu wrote: Miscellaneous observation: superscript 2s aren't being rendered correctly (as in N^2 or S^2), with varied results. (S^2 being turned into a capital Greek sigma, for instance.) I've checked footage of the game and they are supposed to be there, so maybe you have a better idea of what's going on? There are multiple versions of SHIFT-JIS - I might be using the wrong one, hmm. Or maybe the PSP has its own custom set (doubt it). Very cool to hear that the speakers can be identified. Nice find! I did a quick check, and Shift-JIS lacks a char for "superscript 2" in either the Windows-31J or basic JISX-0208 flavors. So they might have made a substitution in the font, in which case Sigma will become S^2 (as a single full-width character) when it goes back into the game. Edit: Apparently there's a few different capital Greek letters. In fact some characters that look Latin at first glance are, in fact, Greek. "ΑΤフィールド" -- Alpha Tau, rendered as A.T.
"ΘΑ" -- Theta Alpha, perhaps J.A.? My guess is that, for the game font, it just looks better for "A." to be a single full-width glyph rather than two half-width glyphs. Baz wrote: Very cool to hear that the speakers can be identified. Nice find! So yeah it looks like the game does override the Greek character set within the SJIS font. Didn't know that use-case was possible. It might explain why they shipped with their own font plugin instead of using the system's own plugin. @Reichu:/@Kira: - Do you think it'd be better to make evs_translate have duplicates with each speaker, or, should I get rid of duplicates and leave out the speaker? so that way you folks only have to tweak the duplicates per speaker. And something else, the imtext_translate etc. files also have three params, but I stripped those out. Another possibility for the parameters: the expression in the portrait. Last edited by deeRez on Thu Mar 01, 2018 2:47 am, edited 1 time in total. Nice, Baz! Does this also mean the N that appears in Νミサイル is actually a nu that's rendered as N^2? @deeRez, what does this mean for the translation? Will we be rendering the superscript 2 a different way? 0x001B9728 to 0x001BA6CC Big mess of battle stuff. A bunch looks like labels and descriptions for when Misato is managing the Evas before battle. Some of these I recognize as battle commands not present in section_data. There's some dialogue for special Shinji and Asuka events. All of the attacks for the Angels and JA2 are listed as well, even though AFAIK they can never be played-controlled, nor do I remember them ever being announced by name in-game. The section that includes these might have been used by the programmers to keep track of the battle animations? So 0x001BA14C is probably pointing to the animation used for the missile attack (hence boring ol' Ｎ２); 0x001BA168 is an in-game label for the weapon; and 0x001BA174 is the description accompanying the previous. I was finding the discrepancies a bit mysterious, so having an explanation is nice. @deeRez: I think the numerical value for the speaker should be there for our reference, definitely. How many duplicates are we talking here? How common of a problem is it? I've gotten pretty used to repetitions from working on rodata, but I guess it depends on the SCALE of the repetitions. Reichu wrote: Nice, Baz! Does this also mean the N that appears in Νミサイル is actually a nu that's rendered as N^2? Just double checked this, and yes! It's N² in-game - good catch! Reichu wrote: @deeRez, what does this mean for the translation? Will we be rendering the superscript 2 a different way? For now, call it N2. We can later bulk-replace them with the proper Greek characters so that folks don't have to worry about copy/pasting them right now. you can enable flags like controlling the NPC responses to conversations. So right now if I were to ask Misato for money, instead of the AI deciding the response, I can pick what I want the AI response to be. I'm sure there's a way to do it for enemy NPCs in battle, which would be the menus you're seeing. I haven't made a proper cheat code for the IM-conversation debug menu, and it has a chance of crashing. 1 - Make sure no menus/messageboxes are visible in the game when you enable this, since it hooks unto the menu handler to open up a new menu. 3 - Go back to the game and press O, a new menu should pop up. 4 - You won't be able to cancel out of it pressing X. 8 - Once the new menu loads, now you may use X to exit out of the menu. Reichu wrote: @deeRez: I think the numerical value for the speaker should be there for our reference, definitely. How many duplicates are we talking here? How common of a problem is it? I've gotten pretty used to repetitions from working on rodata, but I guess it depends on the SCALE of the repetitions. Well for the things with multiple speakers, it's usually 16x or so duplications. I could put the list of speakers next to the line + resolve the speakers to a name using that list you posted. So if a line has one speaker you can translate it for that character, otherwise you can translate it loosely and come back to it later. @deeRez maybe a bitfield to indicate the speakers? Codewise, for each speaker y, do x += 1 << y. A bitfield printed as hex is very succinct (maybe too succinct?). Here is the full list of speakers by their hexadecimal code. You'll notice it's longer than the list in rodata -- so while I'm certain that the game is getting the labels for the dialogue boxes from rodata, the evs is splitting things up a bit more. Regarding the EVS and duplicates, deeRez, you have a better idea what you're doing than I, so do what's smartest and easiest for you. Worst comes to worst, I have the "do not translate" version saved to the HDD and can consult it if needed. EDIT: The three parameters in the imtext_translate sample you posted don't look familiar to me (but then I was just focusing on the first parameter in the evs since it could be easily identified). Maybe you can post the full raw version somewhere so we can look at it, just in case any more interesting patterns get noticed? - Eva-## vs. Unit-##: In-game graphics use Eva-## (continuing the original show's tradition of translating #号機 as "Eva-##"). 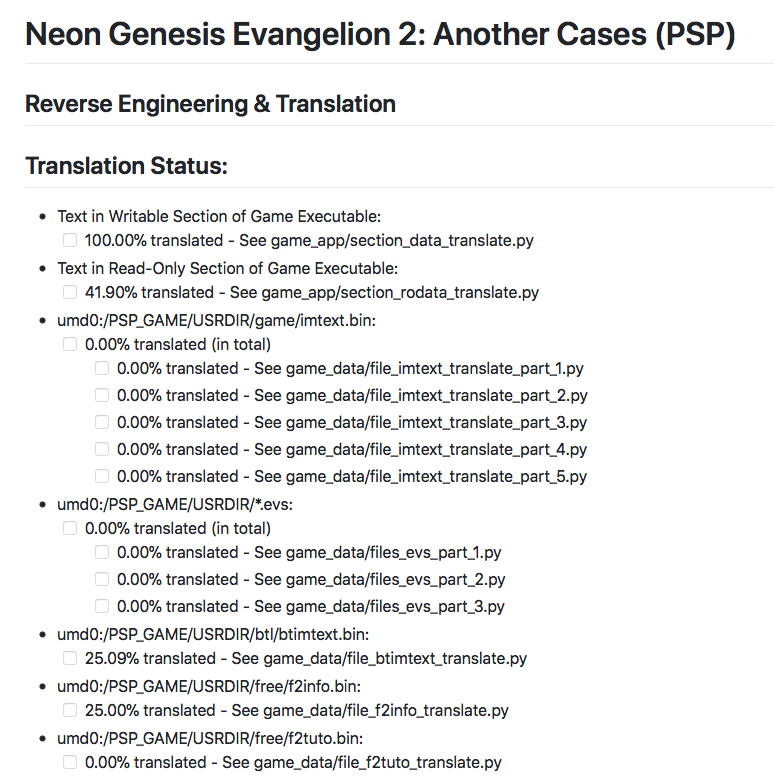 This might be a good reason to use the convention I suggested (初号機 -> Eva-01,　エヴァ初号機 -> Eva Unit-01). - Keel Lorenz, or Kiel Lorenz? Former appeared in print in things like Newtype 100% Collection, but it doesn't make sense as a spelling for a German name. "Kiel" is used in the more recent Evangelion Chronicle. - Use old conventions for Angel names (which were drawn from Newtype and Bandai Carddass), even the ones that make no sense, like "Matarael" and "Ireul"? Evangelion Chronicle changes Matarael to Matriel, Ireul to Yroul, and Arael to Ariel. - Magi or MAGI? Not an organization, so a different consideration. Dan Kanemitsu puts it in all caps. - Special honorifics case: Presumably when something comes up like "Ikari Shinji-kun", we omit the "-kun" because there's no good way to make this work once the name order gets flipped? (Shinji Ikari-kun? Shinji-kun Ikari?? Baz wrote: @deeRez maybe a bitfield to indicate the speakers? It's an entirely different kind of flying, altogether. unless they wanted to trigger more than one voice clip at the same time for the same line and thus used a bitfield in the engine to better control it. Will keep it in mind! SAY, would you be willing to join in on the translation effort Baz? Any help here and there would be appreciated! This Saturday, I'll get to dumping a translator friendly version of the EVS files, probably will collapse all the lines and add a speaker line that's a comment. I'll post the verbose IMTEXT_TRANSLATE as well on Saturday. For the guidelines, probably will tackle those at the end of today and put them up for sign-off. The %s is standard in computer programming but not sure what the $n is. I'm thinking things that are $LETTER are part of a second phase of parsing more closely tied to the game engine. $n might just be number. Not sure what $a might be ... actor name? EDIT: Didn't end up getting free time this weekend. Will pace myself and do the above tasks during the tail end of weekdays. @Reichu - my jaw dropped! You're awesome for figuring this out! +# it uses to display in-game. This is now done! The EVS have been properly added. The duplicate lines have been squashed into a single line and there's a # line that shows which speakers utter the given line. If there's only one speaker, feel free to use that speaker's speech mode. If there's multiple speakers, pick a generic speech mode, and then we can revisit the line later once it needs to be converted to each given person's speech mode. For the above two, I will do them later this week during my free time on weekdays. Also minor, I'm now computing stats in the README properly for all files. deeRez wrote: They tend to remove code but keep the art around. There's still a chance it might work if the scenario is stored as a script outside of the game code. Hm, I kind of assumed that maybe the art as an asset was kept, but damn, if they actually kept some of those other scenario, that would be pretty wild! Sorry to interrupt; I honestly... don't understand much of the process/procedure behind this gigantic effort, but a very sincere thank you to all those involved in procuring and polishing all this content! Are you talking about "00000047 Naoko Akagi [for her one line from the PS2 version]"? I just put that note there because #00000047 accompanied only one line of dialogue, which also happened to be the only line Naoko has in the original PS2 version. Her other dialogue is under 0000001E. I have no idea why a separate value was created for her new PSP dialogue. deeRez wrote: The duplicate lines have been squashed into a single line and there's a # line that shows which speakers utter the given line. BTW, there are times when I feel as though putting a note inside one of the translation files would be useful (for instance, to mark a translation that requires checking)... If this is okay, do I just do it by starting the line with # as you've done? deeRez wrote: my jaw dropped! You're awesome for figuring this out! Awww... Shucks... The numbers were REALLY bugging me, so I loaded up a video someone had helpfully made of the completed Classified Info being thumbed through page by page, and voila! The number of pages per entry corresponded exactly to the mystery numbers in f2info! I can't remember the visual context for the tutorial and whether it uses numbered pages similarly, but I guess with that syntax it probably does... I'll keep an eye open. After the translation guidelines are settled and the thread gets reorganized as discussed, I assume we'll want to start recruiting more translators? This is a pretty herculean task, so we need all we can get, and I guess places like reddit, 4chan, tumblr, and twitter could be tapped, for any willing souls lurking about. For graphics modification, I talked to Zeruss about this, and he's up to the task whenever we're ready for him. I'm familiar with his capabilities so I'm confident he can accomplish what's required. Now, since I'm a total blockhead when it comes to the programming side of this, I have no idea how playtesting will work. Kira BB Yamato mentioned being able to load up the game with the translations that had been done, and I'd love being able to do similar, but I wouldn't even know where to begin. Since this involves, I assume, ROM-hacking, any explanation might go into a legal gray area, so feel free to PM or e-mail me if you ever have the time to humor my whimsies. Everything you're doing is black magic to me, but I can follow instructions in a "monkey see, monkey do" sort of way! Regarding hacking / cheat codes / debugging -- I wonder if there are ways to activate specific events and scenes? Things that would help us navigate the full contents of the game and make sure all of the translated text displays properly, and that it also reads properly in context? I assume you have something in mind for ways of achieving this, beyond playing through the game normally and hoping for the best. There are some translation+programming-related issues I want to bring up when your plate is less full, so this is partly a note to myself so I don't forget. If you guys need anyone to help out playtesting, which I doubt you will as I imagine you'll all be able to handle it I might be able to offer my services. I've got 4 years AAA testing experience (ongoing) so I know a few things, although my free time is limited this year for reasons, I would like to help out in some way though. @SSD & @Zeruss & @jcmoorehead - Thanks you three! @jcmoorehead - I think we'll need a generic play-through where someone gets most of the endings the average person will get, and that'll be fine. The one-off crashes / bugs that remain we can tackle as they come up. 1 - Game crashes/freezes/fails silently because it expected text to be a certain length. 2 - Game crashes/freezes/fails silently /doesn't show properly because it expected text to start at a certain position within a bigger piece of text. 3 - Game crashes/freezes/fails silently because it's scanning text for a certain character that was removed. or text was translated that wasn't text but a number that happened to register as Japanese text. Feel free to make changes! The only thing you shouldn't touch is the Japanese within the " " because that's what I use as the ID to access the specific translation (where-as in the other files I use the hex # as the ID). Reichu wrote: BTW, there are times when I feel as though putting a note inside one of the translation files would be useful (for instance, to mark a translation that requires checking)... If this is okay, do I just do it by starting the line with # as you've done? Reichu wrote: After the translation guidelines are settled and the thread gets reorganized as discussed, I assume we'll want to start recruiting more translators? This is a pretty herculean task, so we need all we can get, and I guess places like reddit, 4chan, tumblr, and twitter could be tapped, for any willing souls lurking about. Yes! BUT, from what I've seen from how people react to these things, before we branch out, it's best to have a way to test the translation in progress. Reichu wrote: For graphics modification, I talked to Zeruss about this, and he's up to the task whenever we're ready for him. I'm familiar with his capabilities so I'm confident he can accomplish what's required. I'll make sure to hurry it up with the graphics modification + re-injection then! Reichu wrote: Now, since I'm a total blockhead when it comes to the programming side of this, I have no idea how playtesting will work. Kira BB Yamato mentioned being able to load up the game with the translations that had been done, and I'd love being able to do similar, but I wouldn't even know where to begin. Since this involves, I assume, ROM-hacking, any explanation might go into a legal gray area, so feel free to PM or e-mail me if you ever have the time to humor my whimsies. Everything you're doing is black magic to me, but I can follow instructions in a "monkey see, monkey do" sort of way! Kira is using cwcheat - a PSP CFW plugin - to apply the translations (stored as cheats) to the game. The problem is that cwcheat has a cheat limit and we've hit that limit. Normally, big translation projects go with requiring users to dump the game UMD as an ISO, then patch the ISO with a tool. The patch is a file that has stuff like, "Go to X, replace Y amount with Z"
and if there's a translation update, they tend to not bother reapplying it since it requires the original ISO to reapply. for which they made the translation a plugin for CFW PSPs. it can redirect the PSP to read the given file from the memory stick instead. the plugin dumps the file for you onto the memorystick, and then applies the patch. 3 - The next time the game reads the above file, it skips dumping and re-patching if the file already exists. The upside is that this method will work for both, people who want to play off the UMD or people who want to play off the ISO. But both will require CFW. @Reichu: Does your PSP have CFW? Reichu wrote: Regarding hacking / cheat codes / debugging -- I wonder if there are ways to activate specific events and scenes? Things that would help us navigate the full contents of the game and make sure all of the translated text displays properly, and that it also reads properly in context? I assume you have something in mind for ways of achieving this, beyond playing through the game normally and hoping for the best. Just not sure how to approach it. Hmmmm... I could find where the cutscene files are loaded in the code, then I can work my way back up to find out what top level code requested the the file to be loaded, followed by figuring out how to hijack it. Does the game have cutscenes that happen while the player is standing still? I do know there's the angel appearance one that happens when the clock runs out but I don't want to hijack that one cause if there are events that happen randomly, I rather tweak the randomness. The cutscenes I've witnessed so far are all after I selected something in the world-map menu. Reichu wrote: There are some translation+programming-related issues I want to bring up when your plate is less full, so this is partly a note to myself so I don't forget. Reichu wrote: Are you talking about "00000047 Naoko Akagi [for her one line from the PS2 version]"? I just put that note there because #00000047 accompanied only one line of dialogue, which also happened to be the only line Naoko has in the original PS2 version. Her other dialogue is under 0000001E. I have no idea why a separate value was created for her new PSP dialogue. Her PSP dialogue (about work and Ritsuko's studies) is the stuff in the Part 2 list, right? As an aside, I can help with dialogue translations (descriptive Japanese like the CI files, not so much ) in a "two heads are better than one" way, just drop me a PM if you get stuck anywhere! Sorry for my conspicuous absence. I thought I would be done with tests last Thursday. Then I had a midterm and a test on Tuesday, a test yesterday, a test today, and a test tomorrow, and a presentation next Monday, and another midterm next Thursday! It's been hectic. I'll try to chip in as much as I can soon here. I might even be able to persuade somebody I know IRL to help out with all this as well. deeRez: I'll respond in greater detail later, but quick question... With files_evs_part1~3, is it okay if I move the text blocks around so that related stuff is closer together? One example would be putting the Leliel stuff side-by-side in pilot order rather than having it scattered everywhere. If there is a max file size we're trying to stay under, I can follow those parameters while moving things around, no problem. Reichu wrote: deeRez: I'll respond in greater detail later, but quick question... With files_evs_part1~3, is it okay if I move the text blocks around so that related stuff is closer together? One example would be putting the Leliel stuff side-by-side in pilot order rather than having it scattered everywhere. If there is a max file size we're trying to stay under, I can follow those parameters while moving things around, no problem. but, keep the act as a separate commit/transmission to GitHub. In other words, don't do a move and translation in the same edit. To explain why, each change is a mutation on the previous (to the human user). And if you move and modify a line at the same time, it gets harder for the system to recognize if something was newly added or if something was moved. The system will still work fine, but it presents the change to the human user as a giant mess. And that's bad because if something went wrong in the move, to undo/revert it, it becomes harder to disentangle (for the human user) if there are also translation changes. Kira & Reichu - I'm thinking that holding off on translating IMTEXT (the HUGE) one is best, as you've already been doing. Instead focus on 100%ing the rest like rodata, EVS, the CI. This will make it easier to introduce new folks since they'll only have IMTEXT to tackle. Furthermore, if we figure out the speaker information for IMTEXT - it'll be easy to update it if IMTEXT has not already been modified.